UCF’s Collegiate Cyber Defense Club, also known as Hack@UCF, was crowned champion for best overall performance in 2015 for a second consecutive year. The team was awarded the Collegiate Cybersecurity Championship Cup because it had the best record among universities in cybersecurity competitions during the academic year. Thomas Nedorost, the team’s faculty advisor, accepted the championship trophy during an awards ceremony at the 49th annual Hawaii International Conference on System Sciences in Kauai last week. The award program is designed to encourage student participation and reward performance across multiple cybersecurity competitions. Teams gain points for participation and placement in disparate cybersecurity competitions, said Gregory White, director of the Center for Infrastructure Assurance and Security, which runs the competition. Competitions are weighted based on a number of factors such as geographic scope, number of teams, team size, and technical level of each competition. During the competition year that ran from June 1, 2014, through May 31, 2015, UCF students participated in 21 cybersecurity competitions. The scoring algorithm considers each school’s 12 best competition scores when calculating the top school each year. 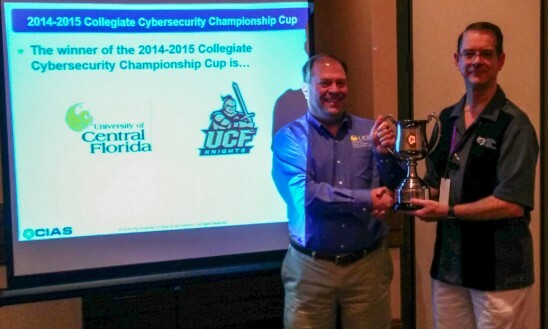 UCF’s best finishes during the season included finishing 1st in the 2015 National Collegiate Cyber Defense Competition, 1st in the 2015 Southeast Collegiate Cyber Defense Competition, 2nd in the 2014 MITRE’s STEM CTF, 3rd in Comcast’s 2014 CSI CyberSEED Software Challenge, and 3rd in Microsoft’s 2015 Build-The-Shield Competition. CTFtime.org ranked UCF’s “Knightsec” CTF team 119th out of 8,535 international teams and 17th out of 472 US teams for 2015. The Collegiate Cybersecurity Championship Cup program is supported through a grant from the Cyber Security Division in the Science and Technology Directorate of the Department of Homeland Security and is managed by the Center for Infrastructure Assurance and Security at the University of Texas at San Antonio. Students created UCF’s Collegiate Cyber Defense Club in 2012 to promote a security-aware generation in Central Florida. The club has grown to more than 200 active members and holds weekly meetings during the school year, hosts cybersecurity guest speakers, provides training in offensive and defensive cybersecurity techniques, and participates in virtual capture-the-flag competitions under the name “Knightsec.” The 12-member team won the Southeast Collegiate Cyber Defense Competition the past three years and the National Collegiate Cyber Defense Competition the past two years. To learn more about the team and club click here. Several of the club’s original members have graduated and gone on to work in cyber security for big firms including Microsoft.